These macros don’t save a ton of time—they save literally two key presses per use—but they help with “flow” when I’m working on something: I don’t have to stop everything for a dialog that sits there onscreen until I remember to press a couple of keys. Instead, I only have to face that dialog when I’m using one of my lesser-used Paste Special commands. You can then assign a keystroke to that in Excel (I use command-shift-option-f). Internal macros are definitely a solution. But they’re harder to explain to non-Excel power users, and you have to remember to port them across to new machines/OS installs. I used to use a ton of them, but I’ve moved the vast majority out to third party tools when I can. All true. But I don’t switch machines or do clean OS installs very often, and I’ve been trying to *get rid* of third party tools where possible, so the macro option works well for me. Good to have multiple ways of doing things though. I found your page looking for exactly this kind of solution for Paste Values in Excel. 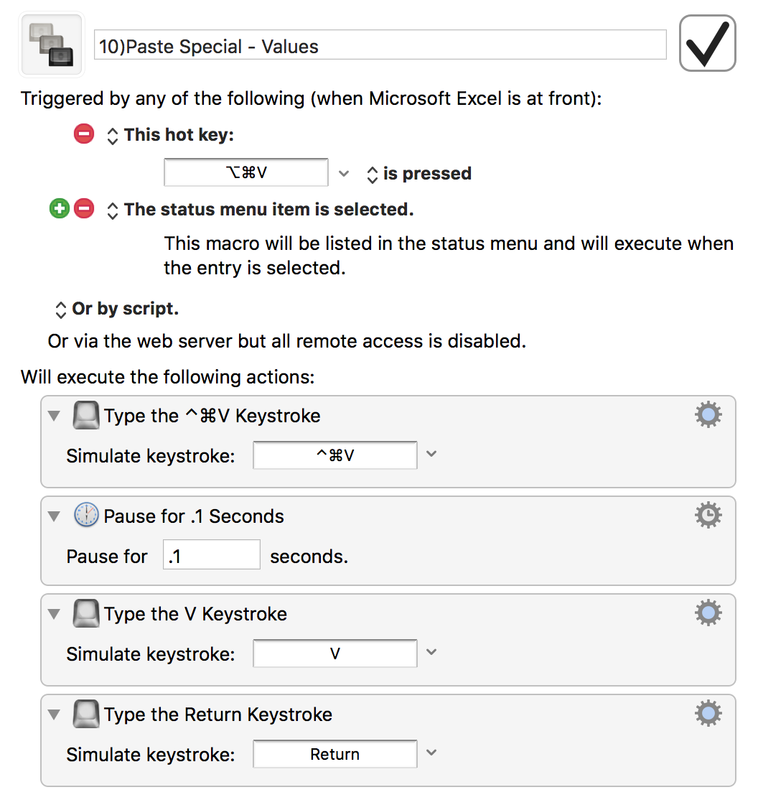 I have replicated your macro exactly, but I can’t figure out why it does not execute any steps past the first (Type the Command-Control-V Keystroke). I am running Keyboard Maestro 8.0.3, Excel 15.39 (171010) Office 365 Subscription (I believe they the most current versions of each). Thanks for any help, here. Your tips on this and other pages are great! Good news! The macro worked after I restarted my Mac! Glad to hear it, as I was pretty much stumped :).